All infectious microorganisms are parasites in the broad sense because they depend on the host animal for essential nutrients and impart some degree of harm to that host. By convention, however, parasitic infections refer to those caused by protozoa and helminths. Protozoa and helminths are eukaryotic organisms commonly referred to as parasites because they live at the expense of their invaded host. Parasitic infections are distinguished from bacterial or viral infections by their complex life cycles and long duration inside the host. This long duration of infection is due in part by their ability to strategically evade the immune system and avoid immune destruction. 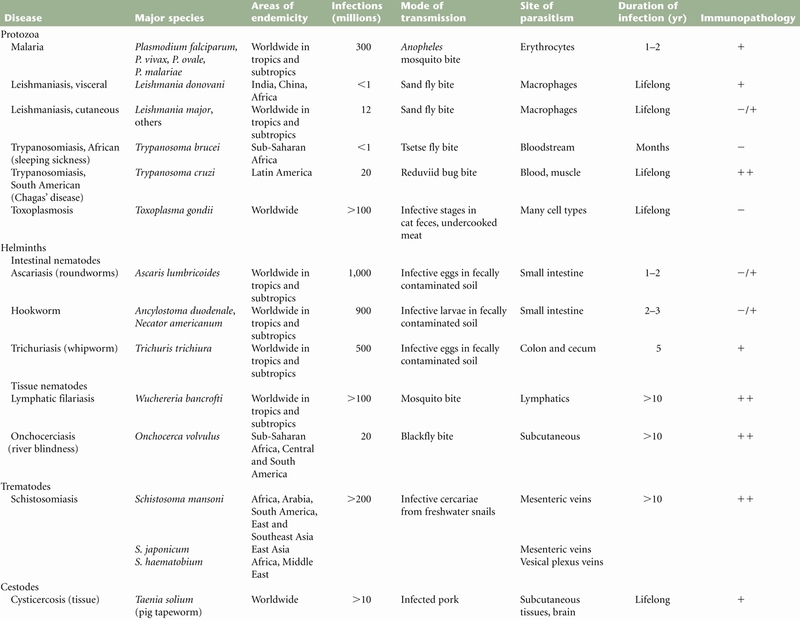 Most parasites undergo radical developmental changes throughout their life cycle, are antigenically complex, and are host specific (Table 1). Table 1. Major parasitic infections of humans. Click to enlarge. Humans are not protective against reinfection to parasites. When infected, cell-mediated response, as opposed to a humoral response involving antibodies, is used to control the invasion. CD8+ T cells (cytotoxic T lymphocytes) and macrophages activated by CD4+ cells (T helper cells) can control protozoan infections. Parasitic specific antibodies are also important. T-cells also play a key role in disease progression and pathology.